A Russian group of signers gathered to make a musical about the Twins Chronicles. The project called Последнее испытание (The Last Trial) emphasized on our beloved character Raistlin. After hearing about it, our group on deviantART thought of a project: making the english subtitles of the musical for the other fans. 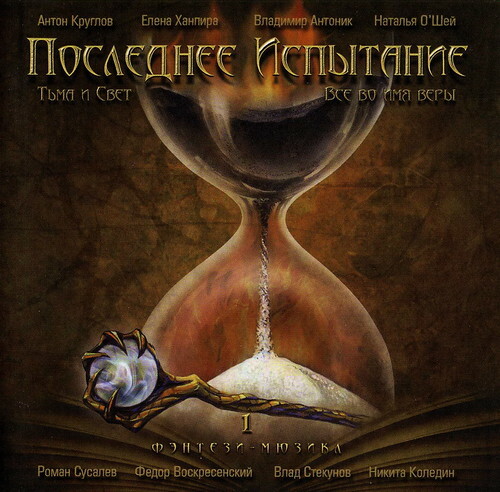 Since we already have the songs, the project can actually begin and it seems we also have quite a little community of Russian dragonlance fans . Obviously, we would need Russian speakers, Russian-English speakers, English speakers to review the result, people that are skilled in making videos for adding the subtitles and maybe artists to illustrate a bit the video. The thread in the link has more videos etc. Thank you for making us some publicity ! Welcome to The Piazza. Thanks for sharing these with us! I just hope that more fans will get to know about this . The Last Trial video is translated. Just click on the little subtitles button below the video and enjoy ! And welcome to The Piazza Coconut-CocaCola! You might want to pop over to the Introduce yourself here topic and say "hi" to the community at large. I just checked the Dragonlance Forums topic, and saw that you said you are redoing the entire project in English! Coconut-CocaCola at the Dragonlance Forums wrote: Hello folks! it sure has been a while. So as you may already know, the russian dragonlance musical has been translated by the group I started 1 year and a half ago. Candice Evenson is now in charge of the group and as for mission to make a new translated version that can be sung. Krunnsub and together the team accomplished their goal. I am currently leading KrynnSub toward its next goal: To rewrite the songs from the Last Trial Fantasy Musical so that they may be sung in English. Since October 2014, the KrynnSub team has worked together to rewrite more than 15 of the songs. We need more English speakers to help us rewrite/edit the music and sing them as demos during the editing process. We need more creative minds, more poets, more singers, and more fans of The Last Trial to ensure this project's success! Do you have an ear for rhyme and meter? Do you want to sing one of the songs we have rewritten? Do you want to edit others' work so that we can have the best possible results? Of course you do. I hope that project is doing well. I have one question. Is there any truth I heard in the rumours that the Russian version Dragonlance excluded one of the characters from the original US version? I realize this is an old post, but I thought I'd go ahead and reply anyway. I'm Candice Evenson, and I'm currently leading Krynnsub. The project is doing VERY well, thank you. We have some extraordinary demo singers and the English rewrites are in the process of being polished from their rough drafts. I do not know anything about rumors, but it is true that Tasselhoff Burfoot--the one the only--is not in the show. It is worth pointing out that the reason for this is clear in the focus the story takes. The musical very much centralizes Raistlin as the main character, while in Legends it was Caramon who was the main character. Tas was Caramon's closest friend, and much of the story was developed through their interactions and Tas also provided a lot of comic relief. In this rock-opera, the focus is on absolute power and absolute downfall and love and temptation and pride. There also is no time travel--the Cataclysm is treated as happening in the present Istar. So the kender is not there to turn into a mouse, go back through time, and allow events to alter. Tas is my absolute favorite, but when I see the direction the musical goes, I can understand why they left him out. As an "Easter egg" however, when you are watching the scene in the Inn of the Last Home, you'll see a couple brightly dressed characters wearing striped long socks--in kender fashion. They are very enjoyable to follow as they listen eagerly to the tale of the Shoiken Grove, try to steal Caramon's letter, then get dangerously close to the axe he is swinging...they also pop up again under cover as clerics in Istar. Anyways I hope that answers your question! I guess I'll head over to the introduce yourself page here soon. Welcome to the Piazza! The video you linked to looks great! I love how much the lead looks like Raistlin. I really like Tasslehoff too, but I do understand that adaptations will be needed. The cameo is appreciate though! Are you a fan of roleplaying games too or did you get into Dragonlance mainly via the novels? I will look for your post in the Introduction thread later then! Hello! I’m popping in to report that we have officially uploaded the first finished song from the Musical in English. More than half of the Musical is in a final draft form (26 songs out of 48) but this is the first time we’ve published a sample of our project. The song is called “Lord of Nothing” and “nothing” refers literally to “nothingness” itself. Nothingness absolute. Raistlin, having slain all other gods has become God. But for all the power he has, he lacks the creator’s skill...and the world begins to collapse. Enjoy the video, and please share it! The song is epic on its own, but understanding the words and being able to sing along adds to the experience.